The Security 1 Door provides extra strength and durability in either a Squareline or Rebate Edge Door configuration. 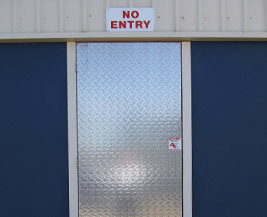 The door is comprised of a Square Hollow Section (SHS) steel sub-frame with a rigid polystyrene or exterior grade marine plywood core and sheeted in pre-painted Colorbond steel. The SHS steel sub-frame enhances the strength and security of the door. The Security 1 door is available in a 40mm and 50mm door thickness. Most locking devices and hardware can be factory fitted to Security 1 Doors. All Security 1 Doors are available in Double Door configurations. Standard finish is pre-painted Colorbond steel. Also available in Zincalume or Galvabond. Factory applied durable polyester powedercoat finish is suitable for Security 1 Squareline Assemblies only. Security 1 Squareline Door supplied with Lietzke Heavy Duty Hinges. Security 1 Rebate Edge Door supplied with pre-fitted heavy duty steel hinges with nylon bushes. 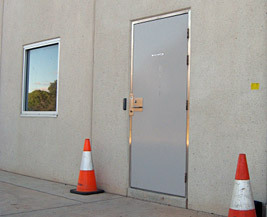 Door shall be a Lietzke Security One Squareline (or Rebate Edge Door)* comprising a steel SHS perimeter sub-frame and a solid polystyrene (or exterior grade marine ply)* core sheeted with pre-painted Colorbond steel and a Squareline (or Rebate)* Edge treatment. The door shall be pre-hung in a Lietzke Flange Fit Frame (or BW Metal Door Frame or Custom Lietzke door frame to suit)* and pre-fitted with the locks and hardware as specified.